As mentioned last night, I had much more to post but I just did not have the time to get to it all unfortunately. 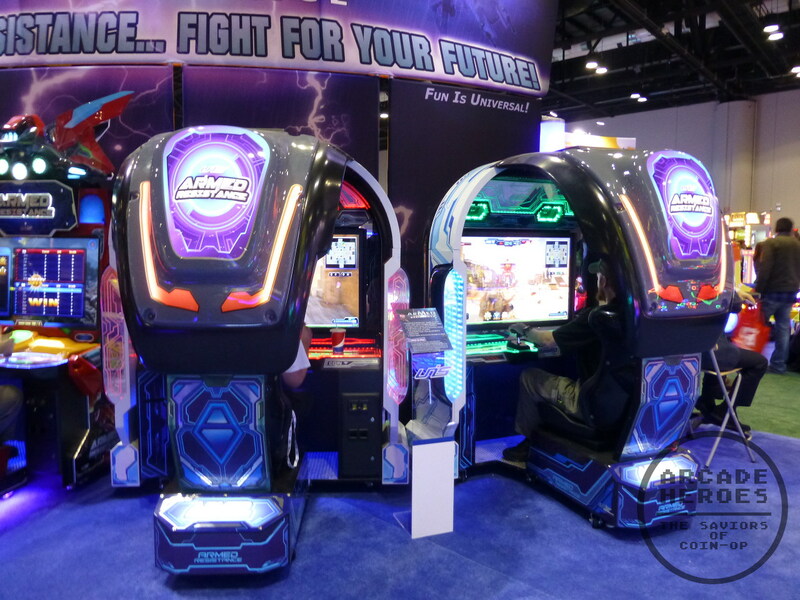 If you haven’t already, here is part 1 of my IAAPA coverage. 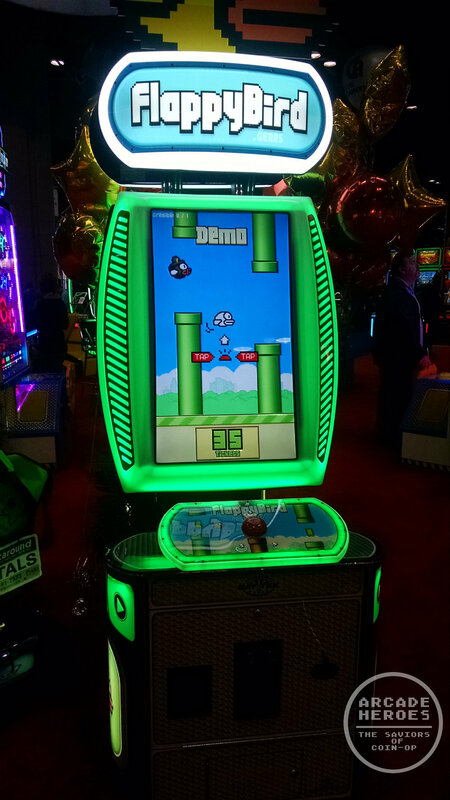 Baytek – Yesterday I only managed a quick walk past the Baytek booth where I caught the new Flappy Bird Arcade. This was released a short time ago and has been showing up at certain venues already. As such, it is Flappy Bird with a big screen and the backlit LED translucent plastics. It should be noted that I did not see BattleShip there, which was at Amusement Expo 2014. 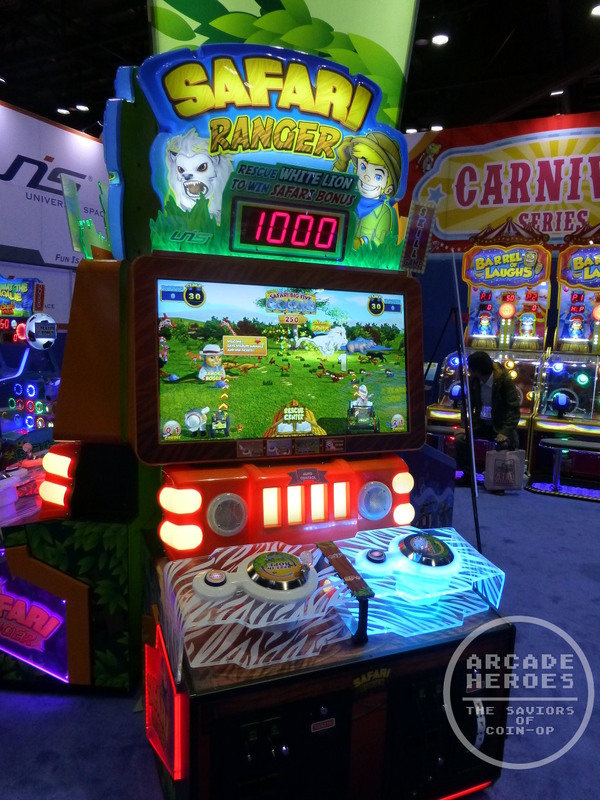 Benchmark Games – One big surprise I stumbled upon was at the Benchmark Games booth. They normally focus on creating popular mechnical redemption games like Monster Drop but they are starting to dabble in video and videmption games. 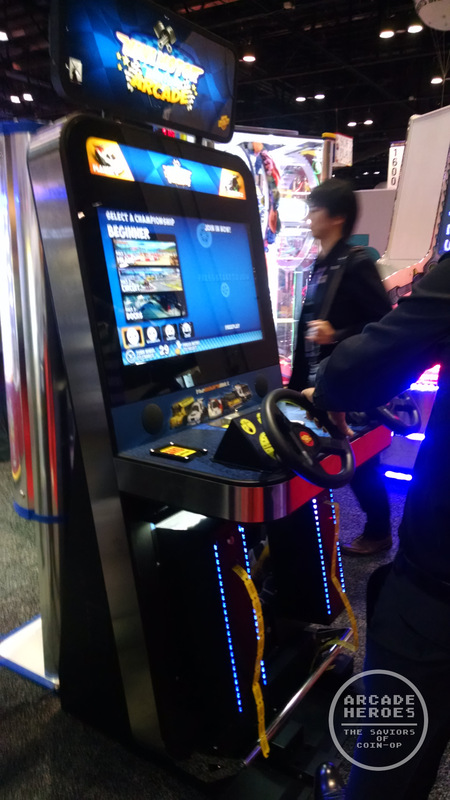 As it so happens, they have Tecnoplay’s Mini Motor Racing Arcade there, you can read previous coverage on this game here. 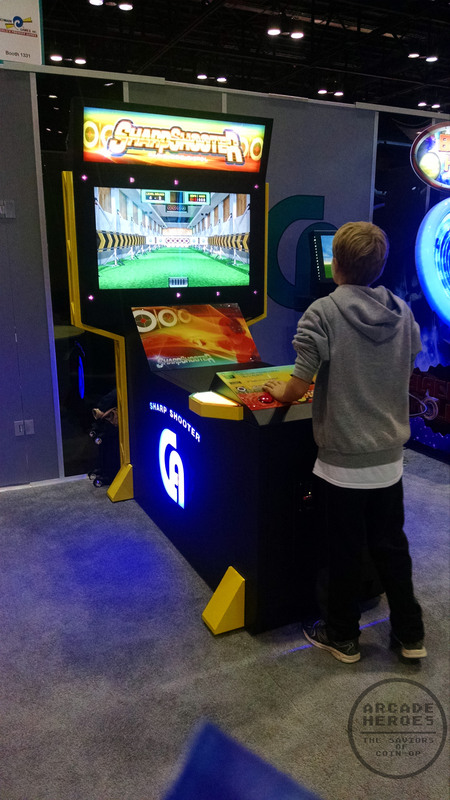 The two cabinets on hand were being played when I walked by and I didn’t have a chance to try it so I will follow-up with impressions on this one but again, I wasn’t sure if this game was going to be at the show, much less at the Benchmark booth. 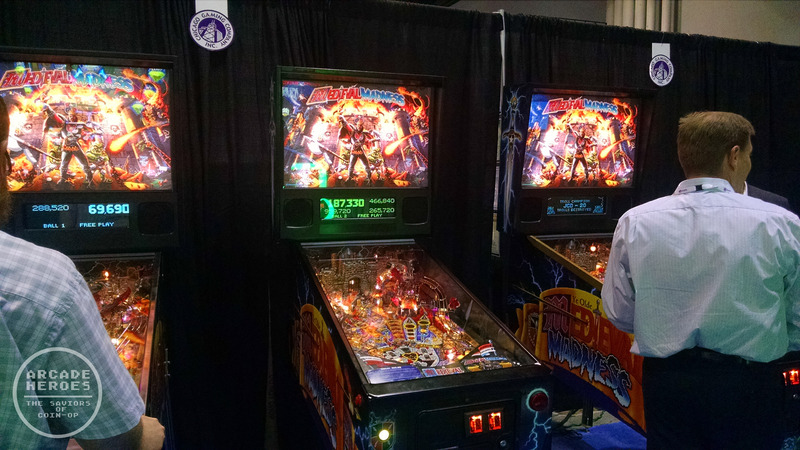 Chicago Gaming – I wasn’t sure if the new and highly anticipated Medieval Madness Pinball Remake was going to be at the show but here it is in all its glory. I didn’t get a chance to play yet but taking just a quick visual look I say it looks really nice. 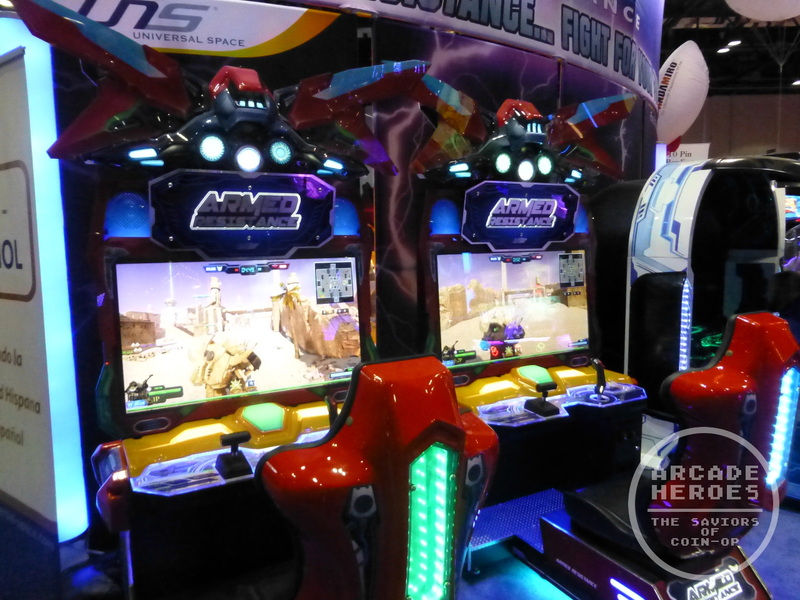 UNIS – Universal Space has generally featured large booths at every trade show where I have seen them but they had quite a line-up of brand new redemption content that had not been seen previously to show for IAAPA 2014. One game I have been looking forward to playing was Universal Space’s Armed Resistance. This arena-based 3rd person shooter is something of a rarity in the modern arcade industry, the likes of which we haven’t seen since games like Sega’s Outtrigger and Atari’s War: Final Assault. The goal of the game is pretty straightforward, capture the enemy base’s to win while protecting your own. The team with the most points at the end of the match wins. One interesting feature is the ability to transform between a walking robot mech suit and a vehicle by the push of a button. The obvious comparison is to a Transformers video game, which we have in the industry but as a light-gun shooter. Armed Resistance plays solidly without any frame rate issues to speak of. There are only three arenas, I will need to check to see if any future updates will add more. Much like Unreal Tournament, the game announces streaks like “Double-kill” “Multi-kill” “Rampage!” as well as announcing headshots. The controls use a simple joystick (for aiming and firing) and throttle (for speed and transforming) combination, the main suggestion I could think of for improvement would be for your machine to turn faster and to have the enemy position compass adjusted so it is not directly in the center of your target reticule. That threw me off a little for aiming however the game does have some auto-aim shots going on to help you along. Strafing would be nice although I am not sure how that can be implemented without a hardware control change; just turning left to right a little faster would probably be sufficient. 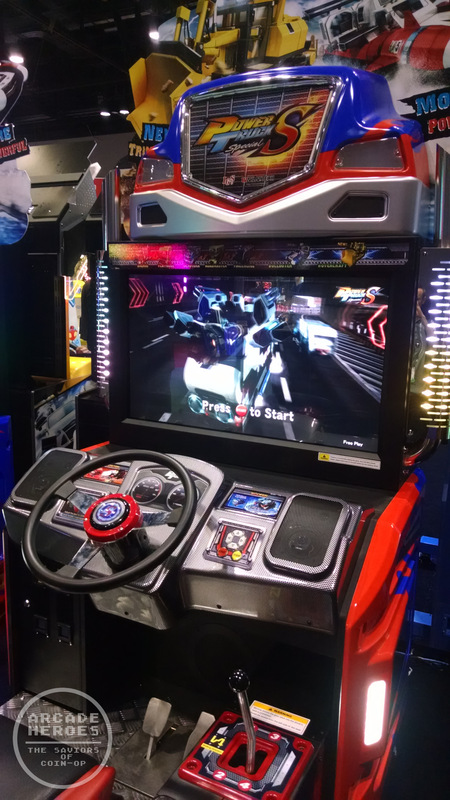 It can support up to 16 locally linked game cabinets for 8v8 team play and will be available in the Deluxe (above) and Standard (below) cabinet configurations, which take up the space of a typical 42″ driver. AR was the main video-only game on their booth, otherwise UNIS’s main focus was on redemption/videmption. 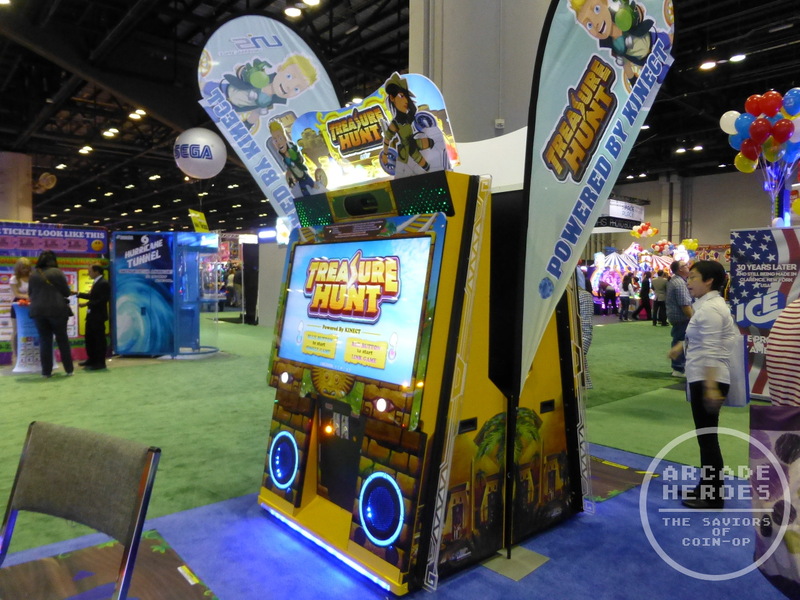 Some of that included the spiritual follow-up to Pirate’s Hook called Safari Ranger and a Kinect-enabled game called Treasure Hunt which combines some elements of a game like Temple Run with some character designs similar to what you would see in a Super Mario Bros. game. They also had another videmption title called Monkey Shake Down which was quite popular. They also have several mechanical redemption games, one gold mining one with water was a cool concept but I forgot to snap a pic. Wahlap – I need to drop by this booth again as I missed some of the content but they had a few video games there to play: Power Truck Special, Monster Eye, Overtake and Teratoma: The Last Rebellion. Here is Power Truck S, which plays a lot like the original Power Truck. In fact it has been so long since I played PT that I am not 100% sure what the differences are, more vehicle and track selections certainly but it is hard to pinpoint otherwise. Otherwise one surprise for the Wahlap booth was a big focus on some new redemption piece, previously I only recall them focusing on video. 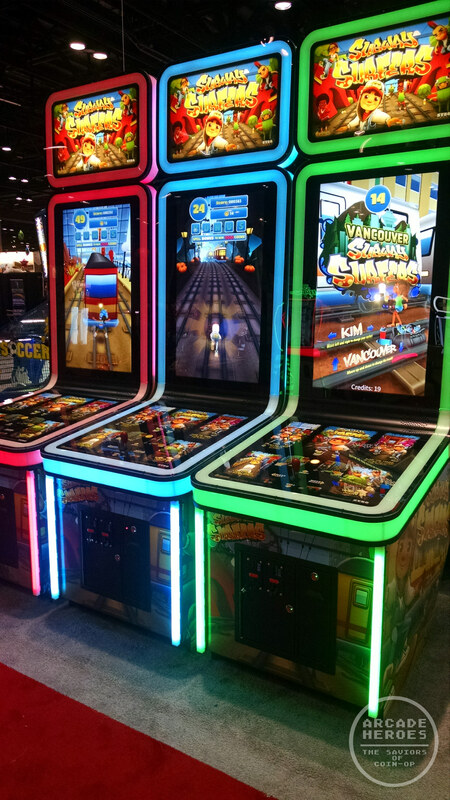 Very awesome games at IAAPA! I wonder what happened to Battleship though,I have a feeling Bay Tek canned the game but you’ll never know. The game was pulled after poor testing revenue. I hope I come across mini moto racing as I used to enjoy playing indi heat so it be nice to play a game similar again. Is sharpshooter a light gun target game?